Shuttleworth Design has selected NUMECA Internationals FINE/Marine to supply CFD software, and will be working closely with the FINE/Marine development team to enhance the company's in-house CFD capabilities. Computational Fluid Dynamics (CFD) offers the capability to explore a wider variety of innovative and efficient solutions during the design process. In comparison to experimental testing facilities, CFD offers clear technical advantages including full-scale modeling and in-depth analysis of flow phenomena. CFD analysis is now an economically attractive option for numerous marine applications including resistance & propulsion analysis, seakeeping, manoeuvring, optimization studies, and hydraulics. Rather than using CFD as a verification tool alone, close integration of CFD as early as possible in the design loop brings large added value to the engineering process. The Shuttleworth 39 Trimaran has been launched by owner Andrew Fennel and will be undergoing sea trials this summer. To see more images click here. Peter and Toni Nice complete circumnavigation aboard their Advntage 44 Catamaran "Tigger"
Peter and Toni write... Tigger, our Advantage 44, has just completed a circumnavigation. We left the UK 15 years ago and crossed our track 17:00 on 12th Feb 2018 at St Pierre in Martinique after 4655 days (12 years and 9 months) a distance in excess of 50000Nm. After crossing the N. Atlantic we spent 6 years in the Pacific and 4 years in Asia then crossed the Indian Ocean and S. Atlantic. Since her launch we have covered closer to 70000Nm. We have sailed in sustained winds of 57 knots with 8 metre breaking waves at speeds in excess of 20 knots, Aruba to Cartegena in 50 hours. Laid a hull in 40-50 knots on passage from NZ to Fiji. We have also covered incredible distances under sail in winds below 10 knots Nukuoro to Palau in 6.5 days. We beat back to Reunion Island, from a position 150Nm south of Madagascar, against the trades to avoid a storm in the Mozambique channel, covering 622Nm in 81 hours. The storm subsequently caused devastation in Richards Bay. We often achieve 200+Nm/day on passage our best 24 hours being 254Nm. After nearly 20 years afloat structurally Tigger is as sound as ever and we have never worried about her integrity at sea, a testament to John's design and the builder Burkhard Bader. 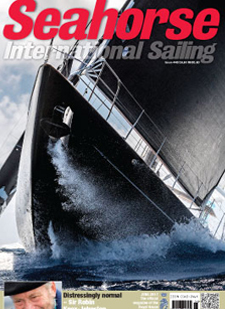 "On Board with Anto Marden" To read the full article click here. 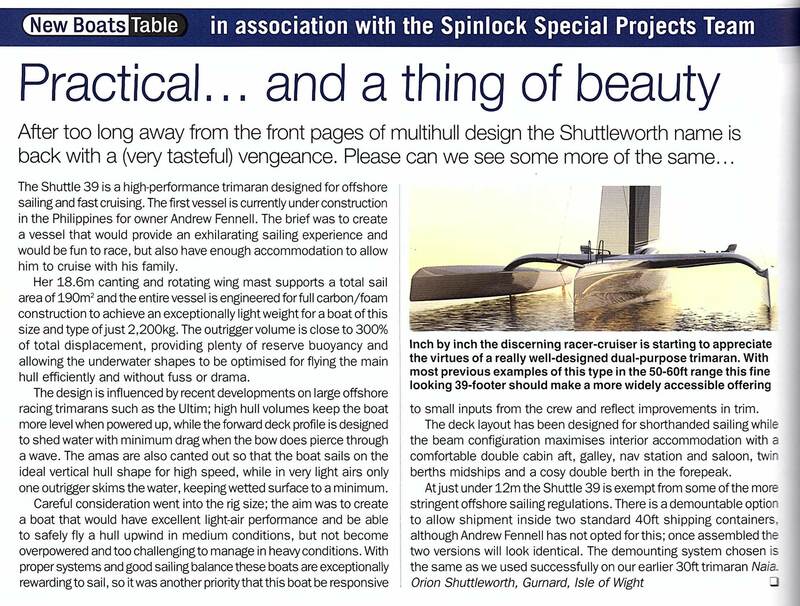 "After too long away from the front pages of multihull design the Shuttleworth name is back with a (very tasteful) venegence. Please can we see more of the same..." To read the full article click here. 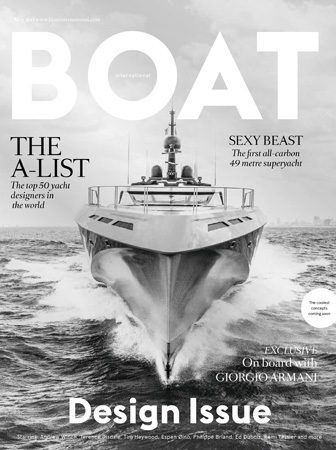 "Following the launch of the power trimaran Adastra by McConaghy Boats in 2012, the yachting media rushed to publish articles with evocative titles such as "The Future Of Superyachts Is Here" and "The Trimarans Are Coming". The reality is that the trimaran configuration has remained an exciting, but elusive, concept. 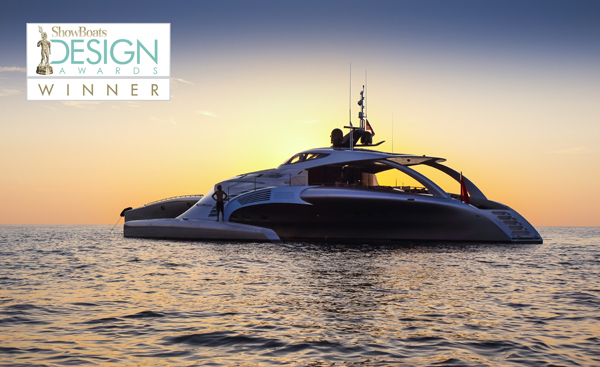 Five years after her launch, Adastra"s designer, captain and owner discuss whether trimaran superyachts can ever become mainstream" To read the full article click here. 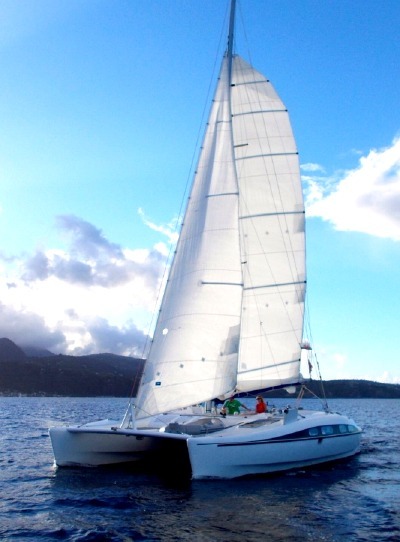 The owners of Adastra have decided to offer the opportunity to charter Adastra and experience sailing and cruising aboard this "Ocean Greyhound". Currently based in the Caribbean. For more information contact Shuttleworth Design. 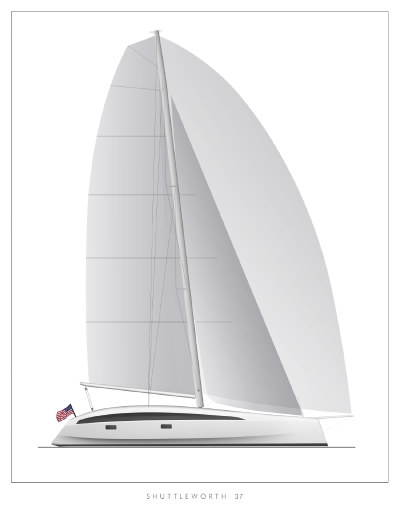 The Shuttle 39 is a high performance trimaran designed for offshore sailing and fast cruising. The first vessel is currently under construction in the Philippines for owner Andrew Fennell. On 24th October a Crowdfunding campaign was started to help raise funds to build the Mayflower Autonomous Ship (MAS) which aims to sail across the North Atlantic Ocean in 2020 in the footsteps of the Pilgrim Fathers. It will be a ship that literally sails itself and promises to be the highlight not only of the Mayflower 400 celebrations in 2020, but for a generation of ocean-going scientific research thereafter. The Plymouth-based company, MSubs, has teamed up with Plymouth University, ProMare (a charitable research foundation) and Shuttleworth Design Ltd to build the world's first fully autonomous and completely unmanned ocean-going vessel. Prestigious companies such as UTC and Silicon Sensing, both with offices in Plymouth, as well as Lockheed Martin UK and a host of individuals both in the UK and USA pledged in the first few minutes and because of their generosity a strong start has been made to the campaign to raise 300,000 pounds. Individuals, families and businesses can all find rewards for every budget. For a 20 pound reward, you can have your name printed on the hull, for 50 pounds your family's names. Alternatively, 35 pounds buys two names and a significant date. For the corporate sponsors, there are also a wide range of options. Also, if you have your own idea about how you would like to work with the project that is not covered with our reward scheme, please do get in touch. To help fund the project click here. Please spread the word and continue to follow the project on Twitter @MAS_400 and Facebook MARS400 for the developments surrounding this historic project. John Shuttleworth will be a guest speaker at the SAP Forum in Basel, Switzerland on Tuesday 8th March. John will chart the development of multihulls from the Polynesians to our latest fully digital Mayflower Project. He will describe his 45 year personal journey of ocean voyaging starting in 1971 with no digital assistance to our current designs, including stories about the amazing characters who have contributed and influenced his approach to life and work. He will explore the design process we use at Shuttleworth Design and how we have applied this to creating these extraordinarily innovative, holistic and sustainable vessels. A pioneering project has been launched which aims to design, build and sail the world's first full-sized (32m), fully autonomous unmanned ship across the Atlantic Ocean. The Mayflower Autonomous Research Ship, codenamed MARS, is being developed by a partnership of Plymouth University, autonomous craft specialists MSubs and Shuttleworth Design. To find out more about Project MARS click here. 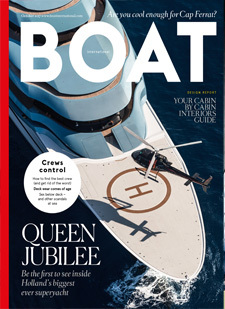 "Look Who Stole The Future - Bill Springer salutes the "disrupters" - boatbuilders and designers who dare to be different and still make it work." To read the full article click here. 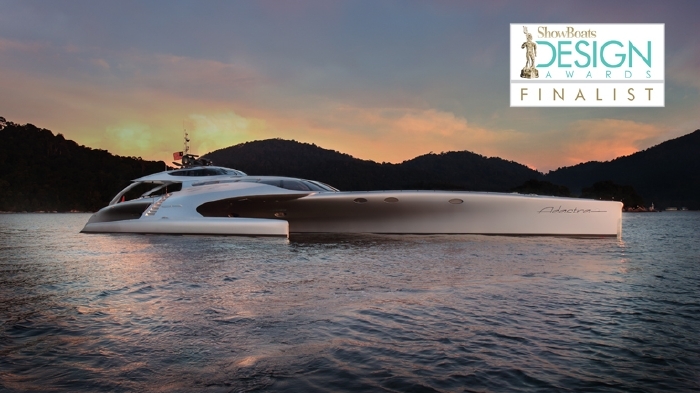 To find out more about the Shuttleworth 32M power trimaran click here. To find out more about the Shuttleworth 70M trimaran superyacht click here. To find out more about the Shuttleworth 80m trimaran superyacht click here. 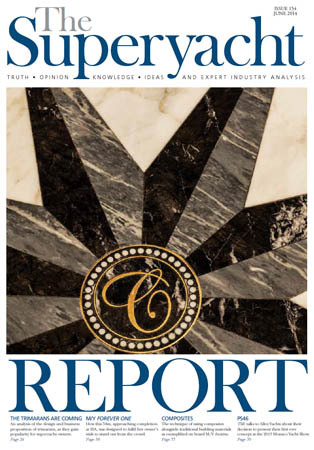 To To read the full article click here. Shuttleworth Design has recently created a development of the highly successful Tektron 35. All the major components of the boat have been reviewed and redesigned as necessary to bring this concept fully up to date. A true open ocean voyager, with a long list of ocean crossings behind her sister ships, this will provide the ultimate combination of cruising and fun sailing. 2011 built Shuttle 31 sold. Mark and Susie Hicks have sold their Shuttle 31 "Aleph". For more about the Shuttle 31 design click here. "I thought I'd let you know that Suze and I (with a friend crewing) have made it across the Atlantic in Aleph. We had a pretty gruelling crossing... After a perfect 'trade-wind' day at the start where we covered over 190 miles in 24 hours we rarely saw less than 25 knots of wind and for several days had 30+ with squalls in the 40s. We also enjoyed large confused seas as the easterly windswell from the strong trades mixed unpredictably with a pretty hefty swell from the north generated by the huge lows that pounded the UK over Christmas and NY. On occasion the cross swells were very large and we had to keep the speed down to stay safe which was frustrating. The asymmetric spinnaker I bought for the trip stayed in its bag and instead a tiny storm jib I hoped to never deploy stayed up for almost half of the passage. I didn't even do any fishing! "The boat performed brilliantly as always, refusing to bury the bows even during some .. steep .. surfs and shipping very little water. "Incidentally we also encountered an unforecast F9 gale off the coast of Morocco in November where I towed warps and chain to slow us down. We'd found ourselves surfing under bare poles but after deploying the warps the boat sat quietly, making 4-5 knots for the most part and happy under the tiller pilot. "Anyway we're very, very much enjoying the Caribbean now and don't plan any long passages any time soon! We plan to stay here until April and then return to the UK by air, leaving the boat in Antigua." In August 2013 Mazda approached John Shuttleworth with the offer of appearing in their Challenger advertising campaign. The Mazda team felt that John's interest in fuel economy and "blank sheet of paper" approach to the design of the Adastra trimaran matched the philosophy of their new SKYACTIV TECHNOLOGY. Discussions with the Mazda production team revealed many similarities in the way both Shuttleworth Design and the Mazda engineers have challenged convention in the drive to create fuel efficient vehicles, whether on land or at sea. John participated in creating advertisements for TV, cinema, web and print. The Shuttleworth designed Adastra trimaran uses one seventh of the fuel of a conventional superyacht of the same size, and can travel halfway around the world on one tank of fuel. The webisode shows the story of how John came to design the vessel with stunning shots of Adastra underway. 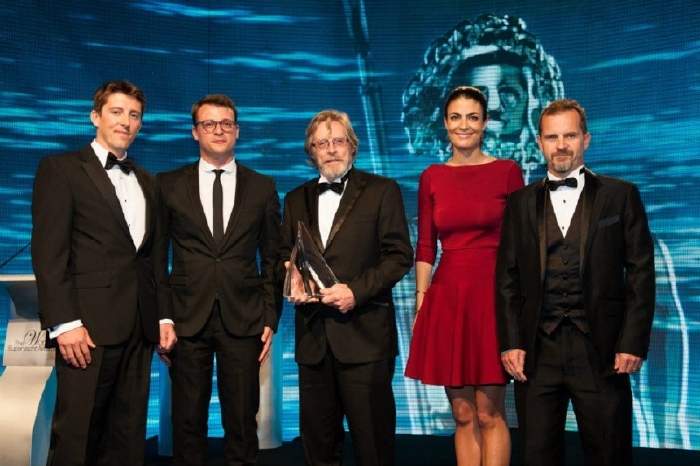 Joseph Oster has sold his Shuttle 35 fast cruising cat "Malahini"
Up against a field of 19 of the best superyachts in the world today, John Shuttleworth Yacht Designs was presented with the Naval Architecture - motor yachts award, at the Showboats Awards 2013 Ceremony at Monaco Opera House. 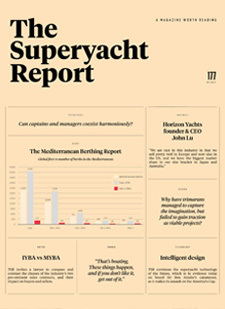 The judges gave the nod to Adastra for her "clean sheet of paper approach" to problem-solving, and noted that her tank tests, as well as the physical evidence provided by designs of similar theory indicate "this yacht will have the best performance in the most sea states of all those presented". Images courtesy of Mark Sims, Superyacht Media. 4. Newcomer of the Year. Left to right - Orion Shuttleworth, Baccarat sponsor, John Shuttleworth, Baccarat sponsor, Mark Evans (McConaghy Boats). John and Orion Shuttleworth have just returned from the prize giving ceremony in Istanbul where they proudly accepted the 'Judges Commendation for Most Innovative Design'. "Adastra was very different. A remarkably low hull weight of 52 tonnes, a usable volume of 132 GT and a top speed of 23.2 knots, combined with her dynamic exterior shape and extremely low fuel burn of around 20 litres/hour at her economical 10.5 knot cruising speed, led the jury to award a judges commendation for extremely innovative design." Shuttleworth Design was responsible for her exterior design, naval architecture, structural design and interior layout.